New Hyde Park, NY – October 10, 2018 – There are over 20 million veterans across the United States with less than 15% qualifying for dental care. 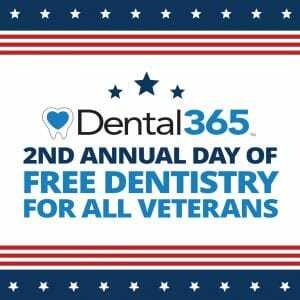 To help bridge this gap, Dental365 will be hosting a day of FREE dental services for all military veterans on Sunday, November 11 from 9am-3pm at participating locations. Participating locations will be accepting walk-ins—alternatively, veterans can schedule an appointment for care by calling 844-636-7331. Founder and CEO of Dental365, Dr. Scott Asnis is no stranger to the veteran community—he began his over 30-year career with a residency at the Brooklyn Veterans Administration Hospital in 1984, where he provided direct care to eligible military veterans. Dr. Asnis and the Dental365 team are honored to be providing these vital services to all our nation’s heroes in celebration of Veteran’s Day on November 11th. Dental365 was founded on the concept of providing convenient and affordable dental care for the entire family. Through its state-of-the art facilities it offers modern dentistry services from expertly trained specialists and general dentistry practitioners. Dental365 has multiple locations throughout the New York Metropolitan area and its offices are open seven days a week, accept walk-ins and offer affordable care and financing options. Dental365 is committed to helping our communities to achieve healthy and beautiful smiles. For more information please visit GoDental365.com.